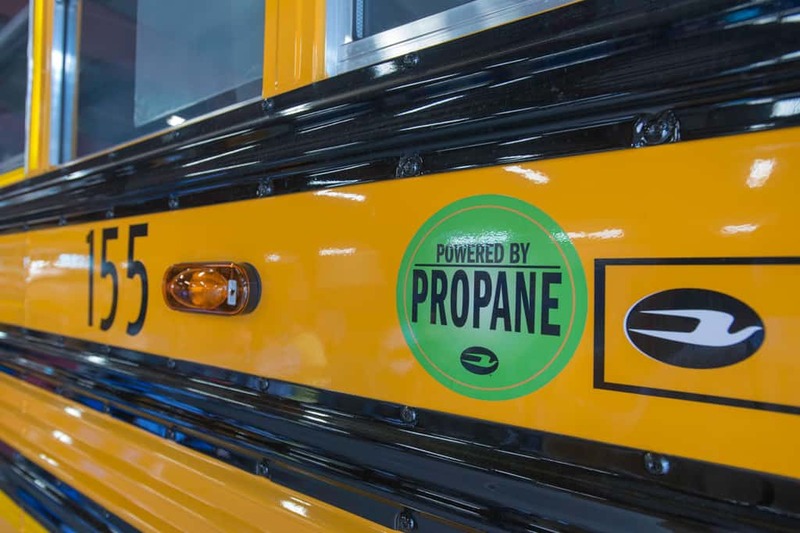 The Propane Education & Research Council (PERC) showcased the benefits of using propane autogas in school buses, while an Illinois transportation director shared her experience with the fuel. Township High School District 211 in Illinois is one of approximately 848 districts, contractors and educational organizations across the U.S. that are using propane, many without any incentive of any kind other than the intrinsic benefits of the fuel, explained Ryan Zic, school bus sales director for ROUSH CleanTech, Blue Bird’s propane drivetrain partner. Diana Mikelski is Township 211’s director of transportation. She explained that her district, which now uses 15 propane buses, didn’t set out on its alternative fuel journey with propane in mind. The district simply researched different options and “propane kept coming to the top,” she added. PERC and bus dealers helped her gather the information she needed. Her technicians were even able to receive hands-on training from ROUSH CleanTech. She also said School Transportation News magazine was a resource that she used as she read everything she could on the topic. As district personnel voiced concerns about propane tanks blowing up, questions were asked and information was sought out to assuage fears and bring more clarity than fear into the considerations. Driver and technicians were included in the discussions. Taylor pointed out that there have been no catastrophic thermal events or fires related to propane fuel or tanks. Mikelski said that there was some initial pushback from drivers over the new fueling procedure, but it was soon accepted as cleaner and easier than fueling diesel buses. Fuel provider AmeriGas helped with setting up the district’s new fuel station and keeping dispensers full. Propane is a “domestically produced fuel that we have an abundance of,” Zic added. Taylor explained that it is safe because of a fueling infrastructure setup that doesn’t require handling toxic materials, or allow spills or leaks. Taylor said it is easy to scale existing fueling infrastructure. Another alternative is to have propane delivered via fuel trucks, or a mobile infrastructure system. “We can get the fuel to you, or we can help you find the fuel,” Taylor promised. Another perk of using propane, Taylor added, is that it doesn’t bear the unpleasant smell of diesel. At one Township 211 schools, the overwhelming smell of diesel necessitated a change. After switching to propane, everyone on campus noticed the marked improvement. Mikelski predicted medically fragile and special needs students would have a safer, more comfortable experience. She also spoke to the reliability of propane by confirming that her propane buses didn’t require pre-heating like diesel buses do. Propane performs reliably even at negative 40 degrees, Taylor added, and produce consistent heat for a comfortable ride. Using propane to fuel school buses also eases concerns over emissions standards, explained Taylor and Zic. Diesel systems already require disciplined maintenance to adhere to the federally mandated emissions level of 0.20 g/bhp-hr for NOx. As the systems degrade, that only gets harder. Phase 2 GHG standards going into effect in 2024 may bring even heavier burdens, so “going forward diesel is going to have some challenges,” Taylor said. Total cost of ownership includes consideration of acquisition cost, any rebates, the vehicle’s lifetime operational cost, and fuel economy. He pointed out that one must also consider the complications and hidden costs that come along with diesel, such as DEF, engine heaters, cleanup and disposal, preventative maintenance, and early start crew wages. When compared to ZEVs, propane also comes out as the cheaper option and provides users with a greater driving range, the presenters said. The ROUSH CleanTech system that Blue Bird uses in its propane buses was recently certified to the optional low NOx standard of 0.02 g/bhp-hr, which Zic explained was already helping users out on the clean energy side. The cost per pound of NOx reduced is $91 for a propane school bus, compared to $1,330 for a diesel bus and $268 for an electric bus. Zic explained that this makes propane a more competitive fuel for grants like the Volkswagen Mitigation Trust funding. Thomas Built Buses and IC Bus also offer propane drivetrain options, so for “those of you who are brand loyal to other companies, there’s a propane solution for you,” Taylor chimed in. Zic shared more real-world cost savings achieved by districts using propane. Clear Creek ISD in Texas reported a savings of 15 cents per mile, while Iowa’s Howard-Winneshiek Community School District reported over double that number. Upper Moreland Schools in Pennsylvania saw savings of “over $7000 per bus” in the first year of use. Contractor Cook-Illinois Corporation reported 80 percent lower fuel costs with use of propane. For student transporters interested in taking next steps toward learning more, PERC is available to help make introductions with local suppliers. In answer to another question, Mikelski shared that there were no special regulations for her maintenance facilities. Taylor added that propane.com is a helpful resource for any regulations that may apply in different locales. “Propane is the proven alternative fuel choice,” he finished.